Oil India Limited Duliajan Recruitment 2017 For Field Chemists Post. Oil India Limited, Duliajan, Assam Has Published the Recruitment Notification for Field Chemists on contract Posts. Eligible Interested Candidates Can Apply Via Online Mode. Last Date for Submitting Online Application form 27 September 2017. 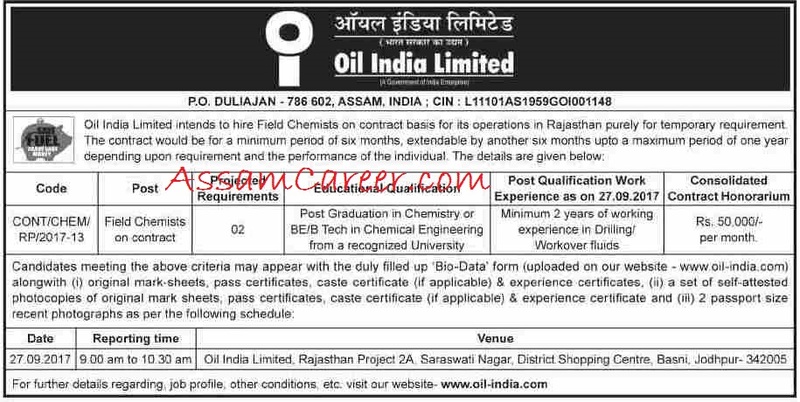 Oil India Limited, Duliajan, Assam Recruitment 2017 For Field Chemists on contract Post. Educational Qualification- Candidates Must Have Post Graduation/B.E/B.Tech in Chemical Engineering From Recognized University/Board. Oil India Limited, Rajasthan Project 2A Saraswati Nagar, District Shopping Centre, Basni, Jodhpur - 342005 .